In this article, we'll answer that question by offering an in-depth review of the best camping cookware currently on the market and a detailed analysis of what goes into the making of the ideal cooking utensils for every type of camping. Let’s start off with our top picks per category for 2019. How to Choose Camping Cookware? Camping can be an adventure, but it can also turn into a difficulty if you don’t have the right cooking kit. With this camping cookware set, you get everything you need to cook a delicious meal without having to bring your whole kitchen with you. The Winterial Cookware Set is both practical and effective and is an absolute essential when you’re out in the woods. This set provides all of your camping kitchen essentials in one well-ordered package. This is an 11 piece set weighing in at a mere 1.5 lbs. The pot and a frying pan along with nine other pieces store within each other and then tuck into a small carry pouch. The teapot is ideal for those chilly winter sunrises and sunsets. Boil water rapidly with the large pot and cook a delicious and nourishing meal with the frying pan. What’s included: 2 Qt. Large Pot and Lid, 1 Qt. Frying Pan, 1 Qt. Tea Kettle, Serving Ladle, 1 Personal Bowl, Serving Spoon / Spatula, Cleaning Sponge and a Carry Bag. All of the pieces are made of lightweight aluminum oxide and have a Teflon coating. These items will hold up to the rigors of the toughest chef. The lightweight aluminum oxide has a high conductivity and is designed to handle high temperatures. With the Winterial 11 piece Camping Cookware and Pot Set you will be ready to take on any camping or backpacking adventure. Make sure you have a good stove to go with this set since it is not recommended to use over an open campfire. This MSR set allows you to cook like a master chef so you and friends can eat like kings. Then wash it all down with a hot drink, mugs included. System includes a single 2.5-liter pot with strainer lid, a single 1.5-liter nonstick pot, two polypropylene plates, one pot handle, and two insulated mugs with lids. A combination of uncoated and nonstick hard-anodized aluminum pots allows you to pick the right tool for your particular culinary style. The included bowls, plates, and mugs give you all the tools needed to enjoy your spread. Nest all the small components inside the 2.5L pot, throw the lid on, and the whole kit fits nice-and-neat inside your backpack. The system accommodates additional insulated mugs (sold separately) so pick up a couple extra. Taking the whole family camping? These durable, non-stick coated, hard anodized aluminum pots are perfect for family meals. The pot and lid combo are perfect solution for stove cooking and the compact, nesting design is reconfigurable for two to four people. The set includes a 3-liter pot, 2-liter pot, 9″ frypan, 2 nylon strainer lids, four 14 fl. oz. insulated mugs, four 14 fl. oz. bowls, four 7.5″ plates, 4 sip through lids, a folding pot handle, and a stuff sack/welded sink. No need to worry about running out of dishes to eat on with this set, but make sure you call “not it” when washing time comes. Pick up the GSI Outdoors- DESTINATION KITCHEN SET 24 and you will be set up for success on a long weekend. Looking for lightweight products to carry on your next camping, hiking trekking trip that will withstand the cruelty of nature? This 3-piece cook set is very lightweight, made of 100% titanium and is dishwasher safe after you get back home. It can easily prepare a meal for 1 or 2 people. It stood up to some good quality abuse and performed as well as more expensive sets. We tested it on a stove and an open fire and it withstood both levels of heat. Whether you’re mountain biking, backpacking or sightseeing in the city it doesn’t matter, this set is perfect anywhere. Finally, enjoy preparing the evening meal without second guessing if you packed everything to cook with. The lightweight, compact, and portable design of the MalloMe cookware set conducts heat rapidly and includes everything you need and is built to last. 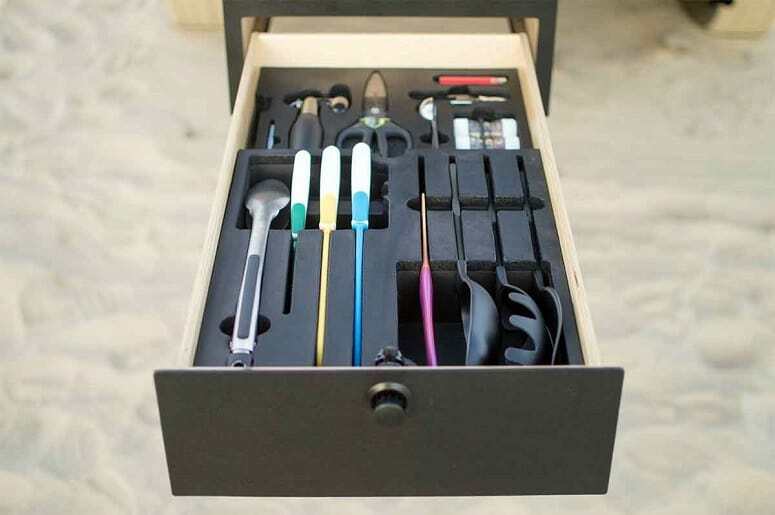 The MalloMe 10 piece camping mess kit includes a 10 recipe EBook, 1 anodized aluminum non-stick pot (1 liter capacity), a pot cover, a non-stick pan, 2 BPA free bowls, a folding stainless steel spork, a soup spoon, a wooden spatula, a cleaning sponge and a nylon travel pouch with drawstring. This kit makes for a perfect gift for anyone looking for a high quality, all-in-one cookware set for camping or to throw in a bug out bag. 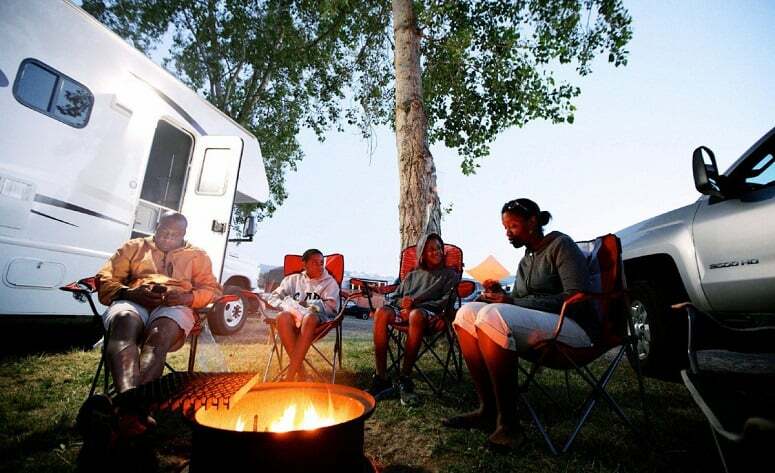 MalloMe is dedicated to customer service and is committed to quality products and delivering a top notch experience for all campers so they stand by their products with a 100% Satisfaction Guarantee. This set tends to go on sale frequently so shop around and pick up couple. Thoughts of relaxing, curled up next to the campfire with a tasty meal settling in my belly is one of the fondest memories from my last camping trip. It is apparent that eating delicious food is a priority when camping, but first it must be prepared and cooked using the proper cookware. Cooking at a campsite is an art, one that many fail at miserably. Not necessarily due to lack of cooking skills but from using the wrong equipment or inferior products. We don’t want that to be the case, next time you have hungry mouths to feed. We decided to put our mouths, bellies and culinary skills to the test with cookware of all kinds to answer some of the unknown questions. Specifically, what types of camping cookware are available on the market today that are practical to use, dependable, and still reasonably priced. We’ve finished our cooking tests, ate a ton of great food and logged our results all to help you make another well-informed decision – determining which camping cookware you should buy for your next trip. Making a good meal when you are camping is exceptionally easier if you have the right cookware. The options that you have for pots, pans, plates and utensils are as varied as the foods you may want to cook, so it’s important that you select the right tools for the job. Not all cookware is created the same, and depending on your camping style, not all cookware is right for you. 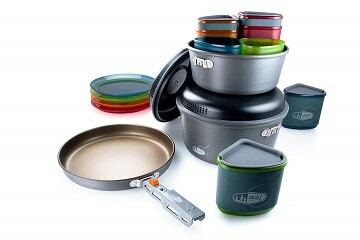 Here are some things to consider when you are selecting the right cookware for your camping adventure. There are a number of types of cookware on the market. Each type has its pros and its cons, and depending on your camping style, some will be better than others. Aluminum – The great thing about aluminum is that it’s lightweight and relatively durable. Aluminum cookware cooks evenly and is great for simmering foods without having to worry about scorching food to the bottom of pans. Aluminum is prone to picking up soot, but does ok in fire. If you are doing a lot of backpacking, aluminum is a great, affordable option. Do remember though, aluminum is a pretty soft metal, and while it’s lightweight, it has a tendency to dent easily. If you’re OK with your cookware looking banged up, but cooking without scorching, you can’t go wrong with aluminum. Hard Anodized Aluminum – With hard-anodized aluminum you have all of the benefits of regular aluminum; lightweight, even cooking, and durability, without the fear of having dented pots and pans. Hard anodized aluminum is a little heavier than regular aluminum, so it will add a little weight to your pack, but it will look better for longer. It’s also more reasonably priced than other options. Stainless Steel – Always a good choice for cookware, stainless steel is durable, good for cooking, and looks great. It is a bit on the heavy side, so it’s a good option if you aren’t hauling your stuff in a backpack. A great option for car camping, or RVs, stainless steel will give you the same experience cooking while camping that you have in your home kitchen. Stainless steel is prone to getting hot and scorching, so it isn’t the best option for cooking directly over the fire. If you are cooking over a camp fire with stainless steel, make sure you use a grate. 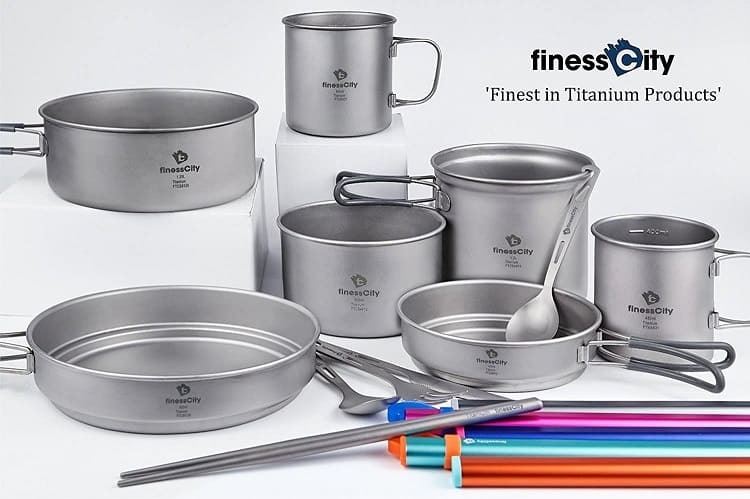 Titanium – This by far the best option you have for camp cookware. It’s lightweight, tough, easy to clean, and looks great. It doesn’t get as hot to handle as other cookware, so it can be used directly in the fire. By far, this is the best cookware you can buy for camping. Just keep in mind, while titanium cookware is the best you can buy, it is also expensive. If you’ve got the extra cash, and want the best, this is the cookware you want. Cast Iron – You just can’t go wrong with cast iron cookware. It is tough, stands up well to high heat, and if you’re willing to buy the good stuff, it will last you for years and years. Cast iron does take some special care, so before you make an investment in cast iron pots and pans, make sure you know how to clean and season them, so they work well. Properly seasoned cast iron will give you a great non-stick cooking surface that can give any modern non-stick coating a run for its money. The problem with cast iron is that it is heavy. This is great cookware for car camping, RV camping, or if you are fine building muscles while you haul around your cooking gear. Coated Cookware – You can buy coated cookware in a variety of different metals. Coatings provide a non-stick surface that helps you avoid scorching and makes clean-up a breeze. Not all coatings will handle the extreme temperatures of cooking over a camp fire, so make sure you do your research before you invest in coated cookware. Also, avoid buying used coated cookware. Older coatings have been linked to a variety of health concerns, so for safety sake, buy new, coated camp cookware for the best results. Plastic – Obviously, plastic cookware has its limitations. It isn’t great with high temperatures, and can impart strange tastes to food when exposed to temperatures that are too high. Plastic cookware is great for backpacking if you are going to be relying on freeze dried foods that only require a bit of hot water. Otherwise, plastic is best left to utensils. There is nothing worse when you are camping than to have cookware that is a pain in the neck to use. When you are selecting your camp cookware, you want to think about how easy it will be for you to cook on it, and how easy it is to clean-up. If you want something simple to use, with quick clean up, consider coated cookware. If ease of use means getting something lightweight and highly portable, you’re going to want to consider aluminum or titanium. Your goal when camping is to have a fun and relaxing time away from home. The last thing you want to do, is battle with your pots and pans. Buying the right gear for your camping needs and skill, will make your experience much more enjoyable. Higher quality cookware will last you a long time. In many cases, you’re going to pay more for better cookware. However, if this means making a single investment, that lasts you many years, and many great camp meals, you’ve made a good investment. If you don’t have tons of cash, you can still get a great product, and with proper care, it should last you for many years. Better quality cookware also means a better meal. With higher quality products, you have less risk of uneven heating, scorched food, or cookware that can’t handle the paces of outdoor cooking. If you’re ready to “wow” your friends and family with your camp cooking skills, make sure your pots and pans match your ambitions. Another important factor you should consider when selecting camp cookware is the distance you’re going to have to haul your gear, and how long you are staying. If you’re going a longer distance, but won’t be staying too long, plastic cookware might be your best bet. If your idea of camping means a comfy camper with a kitchen inside, you shouldn’t be concerned about buying a good quality cast iron cook set. If you’re camping is somewhere in the middle, you might want a durable cook set that isn’t too heavy, making aluminum your choice. If you are still not sure about the right camping cookware for you, here are some frequently asked questions, and answers that might help you make the best choice for your camping adventures. Which Metal Is Most Suitable For Use In Camping Cookware? We like aluminum or hard-anodized aluminum for camping cookware. Aluminum is durable, handles heat well, and is lightweight. Aluminum cookware heats food evenly and reduces the risk of scorched food. It is easy to clean and easy to haul around. While there are other options that are great for cooking around the campfire, we think aluminum is your most versatile choice. Is Aluminum Camping Cookware Safe For Use? There was once a concern that aluminum was a contributing factor to Alzheimer’s disease, causing people everywhere to toss out their aluminum pots and pans. However, after many years of research, scientists have found no evidence that aluminum and Alzheimer’s disease are related. 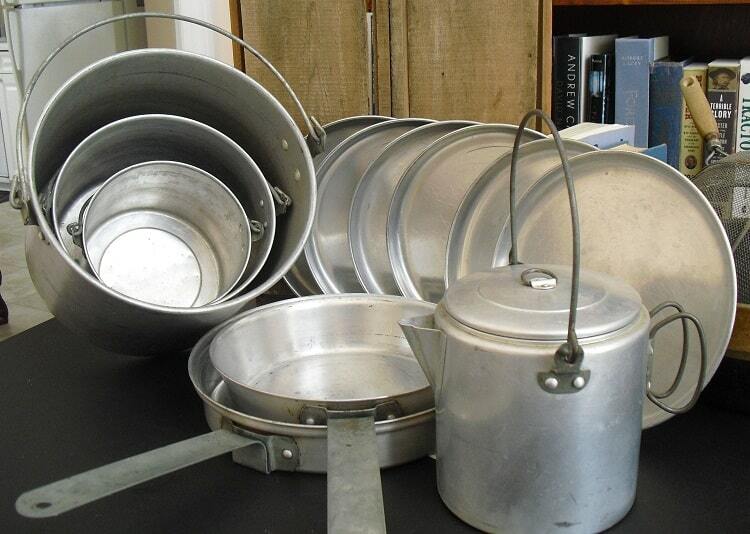 Aluminum is a great material for camping cookware, and is safe to use. If you like the portability and durability of aluminum but want a little more peace of mind, we would recommend aluminum pots and pans that are coated. What Is The Best Way To Clean Camping Cookware? In general, camping cookware can easily be cleaned using warm soapy water. Tough, stuck-on food can be scrubbed using a scrubbing sponge or steel-wool sponge. Make sure that you are using a biodegradable dish soap, especially if you are in the back country. The exception to this rule for cleaning, is cast iron. Cast iron works best when it is not scrubbed clean. For proper cleaning and seasoning of cast iron, wipe down your pots with a paper towel, and maybe a little warm water. Do not use soap on your cast iron. To season your pots, coat them with vegetable oil, and gently warm them, to allow the oils to soak into the surface. Washing cast iron with soap and water will pull out the oils and cause food to stick to the surface. How Do I Remove Soot From Cookware? 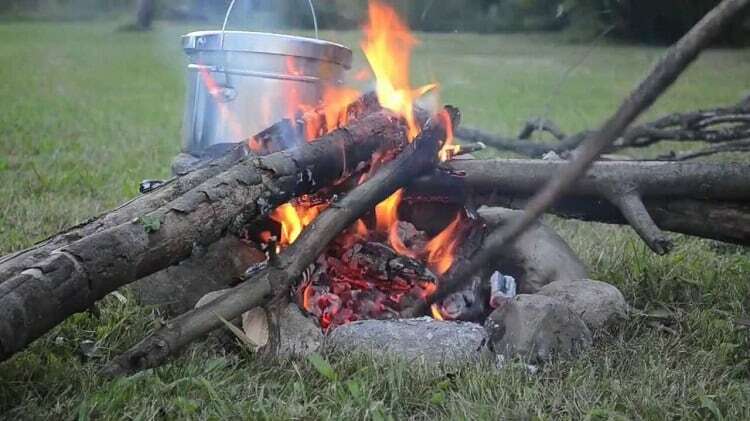 If you are putting your camp cookware directly into your campfire, you will eventually need to remove the soot from the outsides of your cookware. This is a task best done at home, so you may want to wait until the end of the camping season before you undertake this job. The simplest way to do this is to soak your pots for at least 5-minutes in warm soapy water, and then scrub the soot off using a bit of fine steel wool. This should easily remove soot, burnt on food and even sap. However, if this doesn’t work, you may want to try soaking your pots in warm vinegar. The acid in the vinegar will break down thick layers of soot and food, allowing you to easily scrub it off using a nylon sponge or steel wool. How Do I Organize My Camping Utensils? This is a matter of personal preference, and the type of camping you are doing. If you have space, and are mostly car camping, you probably want to invest in some storage bins that can hold utensils, pots and pans and even other cooking supplies. This will keep all of your kitchen gear together, and protected from weather, animals and wear and tear. If the bulk of your camping is done from a backpack, we would suggest that you invest in cook sets that allow you to stack and pack all of your gear in one small unit. 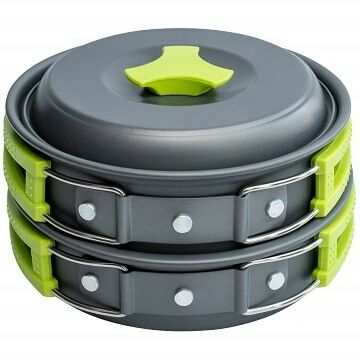 There are great backpacking cook sets that have pots, handles, eating and cooking utensils that all fit together, are lightweight and compact, just perfect for fitting in your pack. What Camping Cookware Can You Put Directly On The Fire? You have two affordable options and one high-end option for cookware that holds up well over the open fire. If you are camping from a backpack, go with hard anodized aluminum. It is lightweight, and conducts heat evenly. If you are mostly a car/RV camper, you can’t go wrong with cast iron. A good cast iron pot or pan will last you for years, and will easily stand up to the higher temperatures of open fire cooking. If you want the best option on the market, and you’re willing to spend the money, titanium cookware is also great over the fire. Cooking and dining next to a campfire with friends is what makes the experience come together. Part of successful cooking while camping are the cookware and utensils that you’ve brought along to make the meals everyone is craving. Our objective was to determine the best camping cookware suitable for a wide range of situations and needs of campers. Yet, we also tested different materials, the ease of clean-up after cooking, and of course we wanted to test a variety of good foods. Fortunately, we are skilled camp cooks, and had no problem cooking plenty of food for the sake of research. We cooked all of this food just to help you find the best camping cookware for your camping needs. We want to hear about what products our customers are choosing and why, so let us know, in the comments below, which camping cookware you chose for your next outdoor dining experience.